I'm back on another round of detox, which means bye-bye to all meats and animal products, caffeine, dairy, alcohol, gluten and sugar. It may seem a little insane, as most people often ask me, "So, what are you eating?" Lots of vegetables, legumes, and grains. Which I actually love so giving up the meat isn't a problem for me. I usually have a much harder time giving up the caffeine (I love my morning coffees) and sugar (insatiable sweet tooth). As you can probably tell from some of my previous posts, I'm a big fan of salads. Because salads don't have to be boring with plain old lettuce. Have fun with it. Customize it. Put your favourite things on your salad to make it more exciting for you. 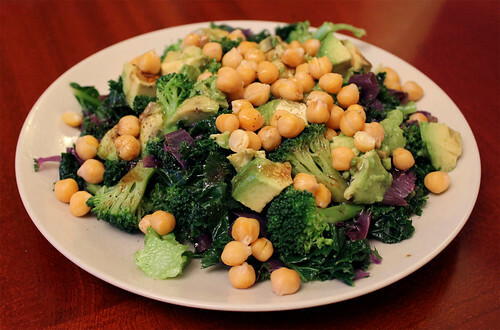 My salad du jour lately is a Kale, Broccoli, Chickpea and Avocado Salad--all things that I love to eat. 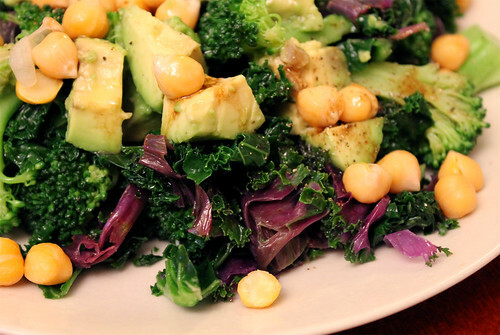 You have the slight crunchiness of the broccoli, the creaminess of the avocado, and a beautiful bright green plate, interspersed with some purples (thanks to the addition of some purple kale). The veggies are tossed with some olive oil, balsamic vinegar, chopped parsley, and salt and pepper. I'm not a big fan of raw kale, so I did blanch the kale and broccoli for a minute before shocking them in ice water. This also helps brighten their colour, making for a beautiful salad presentation in the end. I cooked my chickpeas from dried, but if you're in a hurry, used canned chickpeas instead.